Originally broadcast October 24, 2010, on this week's edition of the show we'll celebrate the birthdays of Roger Wolfe Kahn, Annette Hanshaw and Jelly ROll Morton, fulfill some requests and play some hokum. If you're a more recent listener to the show, it's new to you, and of you're a longtime listener but happened to miss this show when it was first aired, then it's new to you, too! And even if you heard it back in '10, that four years ago and it's worth a repeat. As always, just click on the link below to instantly listen streaming online and/or download the show. And of course, your comments, topic suggestions and requests are always welcome. Enjoy the show! A Little Birdie Told Me So – Roger Wolfe Kahn AHO / Johnny Marvin, v.
Homesick – Bailey's Lucky Seven / Cliff Edwards, v.
Hokum Blues – Dallas String Band with Coley Jones / Band, v.
Hokum Stomp – Hokum Boys and Jane Lucas / Hokum Boys and Jane Lucas, v.
Rapidly Rotating Records is now in the lineup of YesterYear Radio at WYYR.com. 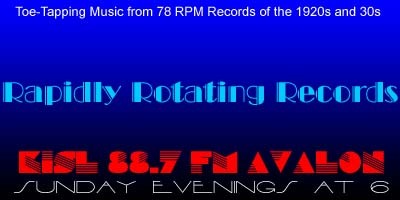 RRR is heard each Tuesday evening at 10 Eastern / 7 Pacific following David Miller's "Swinging Down the Lane." Click in to WYYR.com for some great big band programming.